Ah, fermented foods. Typically, most people cringe at the thought of the food we eat being full of bacteria, but fermentation is actually an age-old tradition dating as far back as 6000 BC; it was used originally to help preserve food and even change the texture and flavour of it to make it more palatable. Some of the earliest known fermented foods include cheeses, wine, yeasted breads, and vinegar. The process of fermentation involves introducing good bacteria into food and allowing it to grow inside of it. This may sound gross and super unsanitary, but good bacteria, or probiotics, are vital to our health. Certain strains of probiotics found in fermented foods can aid in microbial balance inside our gastrointestinal tract. This prevents digestive inflammation and helps to promote a healthy immune system. It’s very important that our gut flora is healthy, as they make up a whopping 80% of our immune system. There are over 100 trillion bacteria cells, about three pounds worth, living in your intestinal tract. They help to protect us against pathogens by taking up all of the living space inside of our digestive system, making competition for survival very difficult for the bad bacteria. The red pepper powder can usually be found in most Asian grocery stores, however, if you can’t find it, I’ve substituted sambal olek (a chili garlic paste also found in Asian grocery stores) and even regular chili powder and they’ve still turned out great. Whatever you’re using, make sure you have plenty of spice on hand because you will usually need anywhere between 3 tbsp to ½ cup of it, depending on how spicy you want your kimchi to be. Because you will be working with bacteria and leaving food to ferment, you want to make sure all utensils and jars are sanitized to prevent bad bacteria from growing in your kimchi. To do this, soak your utensils in boiling water for at least 10 minutes. Use metal and glass utensils, bowls, and jars because they are safer and are less likely to harbour bacteria. General reduction of sodium is usually a good thing, but for this recipe, you need to add the specified amount of salt because it acts as a preservative, protecting your kimchi from mold spores and other harmful bacterial growth. Do not try to reduce the amount of salt in this recipe! 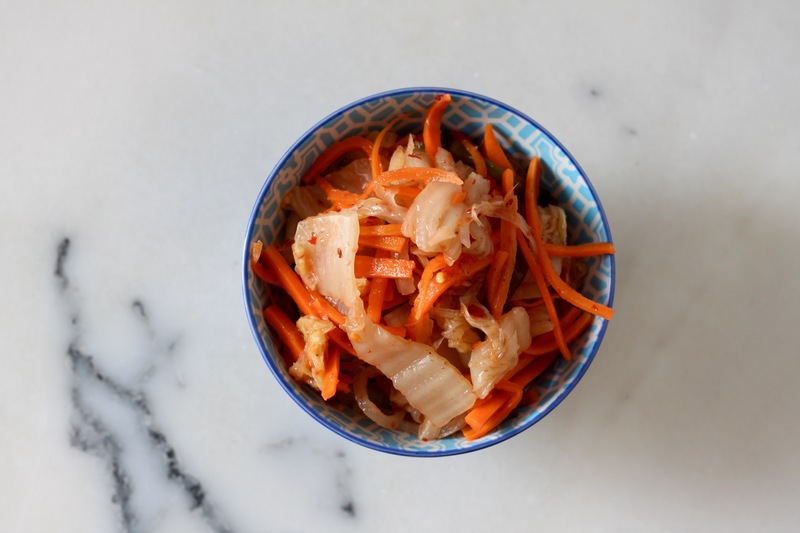 Once you get a hang of making your own kimchi, start experimenting with new ingredients. I personally love to add green onion and granny smith apples to my kimchi, but get creative! The fermentation time will vary for each person. Leave it for ferment for 2-5 days, depending on how sour and intensely flavoured you want your kimchi to be. Make sure the kimchi is always covered in liquid at all times! Top it up with more water if needed. Taste test it every day, when you’re happy with the flavours, transfer your jars to the fridge. They will keep for up to one month refrigerated. 1. Dissolve the salt into 3 L (12 cups) of water. Add the napa cabbage slices and leave submerged for 2-24 hours, until the cabbage is wilted. Rinse out the cabbage with cold running water to get rid of the excess salt. 2. In a large bowl, mix together all ingredients, adding up to ¼ cup water to help mix the spices into the vegetables. 3. Using clean tongs, pack the kimchi mixture into sterilized jars, filling them up about halfway. Make sure to add the residual liquid into the jars, the top of the kimchi should be fully submerged in the liquid. Top up the jars with extra water if needed. 4. Secure a piece of cheesecloth with a rubber band on the top of each jar and leave them to ferment in a dark, dry place for 2-5 days. Good signs of fermentation include bubbles forming in the liquid (from the gas produced by fermentation) and a sharp, slightly acidic aroma. 5. Once the kimchi flavour is as intense as you want it to be, put a lid on each jar and keep in the fridge. It will continue to ferment, but much more slowly due to the cold temperature.